P. Oxy. 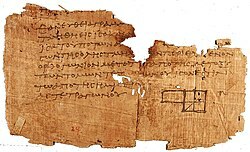 29, one of the oldest surviving fragments of Euclid's Elements, a textbook used for millennia to teach proof-writing techniques. The diagram accompanies Book II, Proposition 5. In mathematics, a proof is an inferential argument for a mathematical statement. In the argument, other previously established statements, such as theorems, can be used. In principle, a proof can be traced back to self-evident or assumed statements, known as axioms, along with accepted rules of inference. Axioms may be treated as conditions that must be met before the statement applies. Proofs are examples of exhaustive deductive reasoning or inductive reasoning and are distinguished from empirical arguments or non-exhaustive inductive reasoning (or "reasonable expectation"). A proof must demonstrate that a statement is always true (occasionally by listing all possible cases and showing that it holds in each), rather than enumerate many confirmatory cases. An unproved proposition that is believed to be true is known as a conjecture. Proofs employ logic but usually include some amount of natural language which usually admits some ambiguity. In fact, the vast majority of proofs in written mathematics can be considered as applications of rigorous informal logic. Purely formal proofs, written in symbolic language instead of natural language, are considered in proof theory. The distinction between formal and informal proofs has led to much examination of current and historical mathematical practice, quasi-empiricism in mathematics, and so-called folk mathematics (in both senses of that term). The philosophy of mathematics is concerned with the role of language and logic in proofs, and mathematics as a language. The word "proof" comes from the Latin probare meaning "to test". Related modern words are the English "probe", "probation", and "probability", the Spanish probar (to smell or taste, or (lesser use) touch or test), Italian provare (to try), and the German probieren (to try). The early use of "probity" was in the presentation of legal evidence. A person of authority, such as a nobleman, was said to have probity, whereby the evidence was by his relative authority, which outweighed empirical testimony. Plausibility arguments using heuristic devices such as pictures and analogies preceded strict mathematical proof. It is likely that the idea of demonstrating a conclusion first arose in connection with geometry, which originally meant the same as "land measurement". The development of mathematical proof is primarily the product of ancient Greek mathematics, and one of the greatest achievements thereof. Thales (624–546 BCE) and Hippocrates of Chios (c. 470–410 BCE) proved some theorems in geometry. Eudoxus (408–355 BCE) and Theaetetus (417–369 BCE) formulated theorems but did not prove them. Aristotle (384–322 BCE) said definitions should describe the concept being defined in terms of other concepts already known. Mathematical proofs were revolutionized by Euclid (300 BCE), who introduced the axiomatic method still in use today, starting with undefined terms and axioms (propositions regarding the undefined terms assumed to be self-evidently true from the Greek "axios" meaning "something worthy"), and used these to prove theorems using deductive logic. His book, the Elements, was read by anyone who was considered educated in the West until the middle of the 20th century. In addition to theorems of geometry, such as the Pythagorean theorem, the Elements also covers number theory, including a proof that the square root of two is irrational and that there are infinitely many prime numbers. Further advances took place in medieval Islamic mathematics. While earlier Greek proofs were largely geometric demonstrations, the development of arithmetic and algebra by Islamic mathematicians allowed more general proofs that no longer depended on geometry. In the 10th century CE, the Iraqi mathematician Al-Hashimi provided general proofs for numbers (rather than geometric demonstrations) as he considered multiplication, division, etc. for "lines." He used this method to provide a proof of the existence of irrational numbers. An inductive proof for arithmetic sequences was introduced in the Al-Fakhri (1000) by Al-Karaji, who used it to prove the binomial theorem and properties of Pascal's triangle. Alhazen also developed the method of proof by contradiction, as the first attempt at proving the Euclidean parallel postulate. Modern proof theory treats proofs as inductively defined data structures. There is no longer an assumption that axioms are "true" in any sense; this allows for parallel mathematical theories built on alternate sets of axioms (see Axiomatic set theory and Non-Euclidean geometry for examples). As practiced, a proof is expressed in natural language and is a rigorous argument intended to convince the audience of the truth of a statement. The standard of rigor is not absolute and has varied throughout history. A proof can be presented differently depending on the intended audience. In order to gain acceptance, a proof has to meet communal statements of rigor; an argument considered vague or incomplete may be rejected. The concept of a proof is formalized in the field of mathematical logic. A formal proof is written in a formal language instead of a natural language. A formal proof is defined as sequence of formulas in a formal language, in which each formula is a logical consequence of preceding formulas. Having a definition of formal proof makes the concept of proof amenable to study. Indeed, the field of proof theory studies formal proofs and their properties, for example, the property that a statement has a formal proof. An application of proof theory is to show that certain undecidable statements are not provable. The definition of a formal proof is intended to capture the concept of proofs as written in the practice of mathematics. The soundness of this definition amounts to the belief that a published proof can, in principle, be converted into a formal proof. However, outside the field of automated proof assistants, this is rarely done in practice. A classic question in philosophy asks whether mathematical proofs are analytic or synthetic. Kant, who introduced the analytic-synthetic distinction, believed mathematical proofs are synthetic. Proofs may be viewed as aesthetic objects, admired for their mathematical beauty. The mathematician Paul Erdős was known for describing proofs he found particularly elegant as coming from "The Book", a hypothetical tome containing the most beautiful method(s) of proving each theorem. The book Proofs from THE BOOK, published in 2003, is devoted to presenting 32 proofs its editors find particularly pleasing. Consider two even integers x and y. Since they are even, they can be written as x = 2a and y = 2b, respectively, for integers a and b. Then the sum x + y = 2a + 2b = 2(a+b). Therefore x+y has 2 as a factor and, by definition, is even. Hence the sum of any two even integers is even. This proof uses the definition of even integers, the integer properties of closure under addition and multiplication, and distributivity. Despite its name, mathematical induction is a method of deduction, not a form of inductive reasoning. In proof by mathematical induction, a single "base case" is proved, and an "induction rule" is proved that establishes that any arbitrary case implies the next case. Since in principle the induction rule can be applied repeatedly starting from the proved base case, we see that all (usually infinitely many) cases are provable. This avoids having to prove each case individually. A variant of mathematical induction is proof by infinite descent, which can be used, for example, to prove the irrationality of the square root of two. (i) P(1) is true, i.e., P(n) is true for n = 1. (ii) P(n+1) is true whenever P(n) is true, i.e., P(n) is true implies that P(n+1) is true. Then P(n) is true for all natural numbers n.
(i) For n = 1, 2n − 1 = 2(1) − 1 = 1, and 1 is odd, since it leaves a remainder of 1 when divided by 2. Thus P(1) is true. (ii) For any n, if 2n − 1 is odd (P(n)), then (2n − 1) + 2 must also be odd, because adding 2 to an odd number results in an odd number. But (2n − 1) + 2 = 2n + 1 = 2(n+1) − 1, so 2(n+1) − 1 is odd (P(n+1)). So P(n) implies P(n+1). Thus 2n − 1 is odd, for all positive integers n.
The shorter phrase "proof by induction" is often used instead of "proof by mathematical induction". Proof by construction, or proof by example, is the construction of a concrete example with a property to show that something having that property exists. Joseph Liouville, for instance, proved the existence of transcendental numbers by constructing an explicit example. It can also be used to construct a counterexample to disprove a proposition that all elements have a certain property. In proof by exhaustion, the conclusion is established by dividing it into a finite number of cases and proving each one separately. The number of cases sometimes can become very large. For example, the first proof of the four color theorem was a proof by exhaustion with 1,936 cases. This proof was controversial because the majority of the cases were checked by a computer program, not by hand. The shortest known proof of the four color theorem as of 2011[update] still has over 600 cases. A probabilistic proof is one in which an example is shown to exist, with certainty, by using methods of probability theory. Probabilistic proof, like proof by construction, is one of many ways to show existence theorems. This is not to be confused with an argument that a theorem is 'probably' true, a 'plausibility argument'. The work on the Collatz conjecture shows how far plausibility is from genuine proof. A combinatorial proof establishes the equivalence of different expressions by showing that they count the same object in different ways. Often a bijection between two sets is used to show that the expressions for their two sizes are equal. Alternatively, a double counting argument provides two different expressions for the size of a single set, again showing that the two expressions are equal. The expression "statistical proof" may be used technically or colloquially in areas of pure mathematics, such as involving cryptography, chaotic series, and probabilistic or analytic number theory. It is less commonly used to refer to a mathematical proof in the branch of mathematics known as mathematical statistics. See also "Statistical proof using data" section below. Until the twentieth century it was assumed that any proof could, in principle, be checked by a competent mathematician to confirm its validity. However, computers are now used both to prove theorems and to carry out calculations that are too long for any human or team of humans to check; the first proof of the four color theorem is an example of a computer-assisted proof. Some mathematicians are concerned that the possibility of an error in a computer program or a run-time error in its calculations calls the validity of such computer-assisted proofs into question. In practice, the chances of an error invalidating a computer-assisted proof can be reduced by incorporating redundancy and self-checks into calculations, and by developing multiple independent approaches and programs. Errors can never be completely ruled out in case of verification of a proof by humans either, especially if the proof contains natural language and requires deep mathematical insight. A statement that is neither provable nor disprovable from a set of axioms is called undecidable (from those axioms). One example is the parallel postulate, which is neither provable nor refutable from the remaining axioms of Euclidean geometry. Mathematicians have shown there are many statements that are neither provable nor disprovable in Zermelo-Fraenkel set theory with the axiom of choice (ZFC), the standard system of set theory in mathematics (assuming that ZFC is consistent); see list of statements undecidable in ZFC. Gödel's (first) incompleteness theorem shows that many axiom systems of mathematical interest will have undecidable statements. While early mathematicians such as Eudoxus of Cnidus did not use proofs, from Euclid to the foundational mathematics developments of the late 19th and 20th centuries, proofs were an essential part of mathematics. With the increase in computing power in the 1960s, significant work began to be done investigating mathematical objects outside of the proof-theorem framework, in experimental mathematics. Early pioneers of these methods intended the work ultimately to be embedded in a classical proof-theorem framework, e.g. the early development of fractal geometry, which was ultimately so embedded. Although not a formal proof, a visual demonstration of a mathematical theorem is sometimes called a "proof without words". The left-hand picture below is an example of a historic visual proof of the Pythagorean theorem in the case of the (3,4,5) triangle. Visual proof for the (3, 4, 5) triangle as in the Zhoubi Suanjing 500–200 BCE. Animated visual proof for the Pythagorean theorem by rearrangement. A second animated proof of the Pythagorean theorem. Some illusory visual proofs, such as the missing square puzzle, can be constructed in a way which appear to prove a supposed mathematical fact but only do so under the presence of tiny errors (for example, supposedly straight lines which actually bend slightly) which are unnoticeable until the entire picture is closely examined, with lengths and angles precisely measured or calculated. An elementary proof is a proof which only uses basic techniques. More specifically, the term is used in number theory to refer to proofs that make no use of complex analysis. For some time it was thought that certain theorems, like the prime number theorem, could only be proved using "higher" mathematics. However, over time, many of these results have been reproved using only elementary techniques. A particular way of organising a proof using two parallel columns is often used in elementary geometry classes in the United States. The proof is written as a series of lines in two columns. In each line, the left-hand column contains a proposition, while the right-hand column contains a brief explanation of how the corresponding proposition in the left-hand column is either an axiom, a hypothesis, or can be logically derived from previous propositions. The left-hand column is typically headed "Statements" and the right-hand column is typically headed "Reasons". The expression "mathematical proof" is used by lay people to refer to using mathematical methods or arguing with mathematical objects, such as numbers, to demonstrate something about everyday life, or when data used in an argument is numerical. It is sometimes also used to mean a "statistical proof" (below), especially when used to argue from data. "Statistical proof" from data refers to the application of statistics, data analysis, or Bayesian analysis to infer propositions regarding the probability of data. While using mathematical proof to establish theorems in statistics, it is usually not a mathematical proof in that the assumptions from which probability statements are derived require empirical evidence from outside mathematics to verify. In physics, in addition to statistical methods, "statistical proof" can refer to the specialized mathematical methods of physics applied to analyze data in a particle physics experiment or observational study in physical cosmology. "Statistical proof" may also refer to raw data or a convincing diagram involving data, such as scatter plots, when the data or diagram is adequately convincing without further analysis. Proofs using inductive logic, while considered mathematical in nature, seek to establish propositions with a degree of certainty, which acts in a similar manner to probability, and may be less than full certainty. Inductive logic should not be confused with mathematical induction. Bayesian analysis uses Bayes' theorem to update a person's assessment of likelihoods of hypotheses when new evidence or information is acquired. Psychologism views mathematical proofs as psychological or mental objects. Mathematician philosophers, such as Leibniz, Frege, and Carnap have variously criticized this view and attempted to develop a semantics for what they considered to be the language of thought, whereby standards of mathematical proof might be applied to empirical science. Philosopher-mathematicians such as Spinoza have attempted to formulate philosophical arguments in an axiomatic manner, whereby mathematical proof standards could be applied to argumentation in general philosophy. Other mathematician-philosophers have tried to use standards of mathematical proof and reason, without empiricism, to arrive at statements outside of mathematics, but having the certainty of propositions deduced in a mathematical proof, such as Descartes' cogito argument. Sometimes, the abbreviation "Q.E.D." is written to indicate the end of a proof. This abbreviation stands for "Quod Erat Demonstrandum", which is Latin for "that which was to be demonstrated". A more common alternative is to use a square or a rectangle, such as □ or ∎, known as a "tombstone" or "halmos" after its eponym Paul Halmos. Often, "which was to be shown" is verbally stated when writing "QED", "□", or "∎" during an oral presentation. ^ Clapham, C. & Nicholson, JN. The Concise Oxford Dictionary of Mathematics, Fourth edition. A statement whose truth is either to be taken as self-evident or to be assumed. Certain areas of mathematics involve choosing a set of axioms and discovering what results can be derived from them, providing proofs for the theorems that are obtained. ^ Cupillari, Antonella. The Nuts and Bolts of Proofs. Academic Press, 2001. p. 3. ^ "proof" New Shorter Oxford English Dictionary, 1993, OUP, Oxford. ^ Hacking, Ian (1984). The Emergence of Probability: A Philosophical Study of Early Ideas about Probability, Induction and Statistical Inference. Cambridge University Press. ISBN 978-0-521-31803-7. ^ Buss, Samuel R. (1998), "An introduction to proof theory", in Buss, Samuel R. (ed. ), Handbook of Proof Theory, Studies in Logic and the Foundations of Mathematics, 137, Elsevier, pp. 1–78, ISBN 978-0-08-053318-6 . See in particular p. 3: "The study of Proof Theory is traditionally motivated by the problem of formalizing mathematical proofs; the original formulation of first-order logic by Frege  was the first successful step in this direction." ^ Davis, Philip J. (1972), "Fidelity in Mathematical Discourse: Is One and One Really Two?" American Mathematical Monthly 79:252–63. ^ Fallis, Don (1997), "The Epistemic Status of Probabilistic Proof." Journal of Philosophy 94:165–86. ^ Herbst, Patricio G. (2002). "Establishing a Custom of Proving in American School Geometry: Evolution of the Two-Column Proof in the Early Twentieth Century". Educational Studies in Mathematics. 49 (3): 283–312. doi:10.1023/A:1020264906740. Pólya, G. (1954), Mathematics and Plausible Reasoning, Princeton University Press . Fallis, Don (2002), "What Do Mathematicians Want? Probabilistic Proofs and the Epistemic Goals of Mathematicians", Logique et Analyse, 45: 373–88 . Franklin, J.; Daoud, A. (2011), Proof in Mathematics: An Introduction, Kew Books, ISBN 978-0-646-54509-7 . Gold, Bonnie; Simons, Rogers A. (2008). Proof and Other Dilemmas: Mathematics and Philosophy. MAA. Solow, D. (2004), How to Read and Do Proofs: An Introduction to Mathematical Thought Processes, Wiley, ISBN 978-0-471-68058-1 . Velleman, D. (2006), How to Prove It: A Structured Approach, Cambridge University Press, ISBN 978-0-521-67599-4 . Look up proof in Wiktionary, the free dictionary.